I have to admit that this might have been one of my best birthdays so far. Usually I don't really celebrate too much and my birthdays always seem a bit awkward to me, but this time everyone went all out. My mother-in-law actually planned out an awesome birthday day which I'll get to in a minute, but for now I will start with the day before. Friday my wonderful husband came home with this delicious cake! 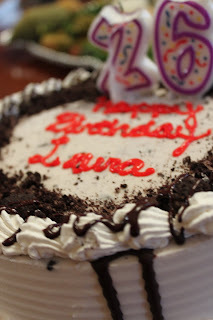 I had actually requested a DQ ice cream cake randomly about a month ago and it totally surprised me that he remembered. Sadly we didn't even touch it till yesterday because of everything else that was going on, but the plus side of ice cream cakes is that they keep for a long time! Friday night we headed out for a celebration of my cousin Garth's birthday and my tag-along birthday at The Parthenon. There were about 20 people there including some of my other family members and some of his friends. I had the Mahi-Mahi which was scrumptious and pretended my sweet tea was a Long Island while everyone else had adult beverages. After dinner everyone headed out in a stretch Hummer limo that he had rented to a local bar. Michael and I drove separate so we would have an escape route. I actually had a lot of fun for a sober and tired pregnant lady. We hung out until about midnight then said our goodbyes. The smoke in the bar was not so good for little pistachio (aka the baby). The next day we woke up early to get ready for my actual birthday. As I was trying on dress pants I realized that little pistachio has in fact grown and therefore I was forced to wear the belly band for the first time. I actually changed later on because I felt completely ridiculous having my pants unzipped and unbuttoned BEFORE lunch. I switched to my dressier skinny jeans which I still couldn't button but at least could zip and still had to wear the belly band, but whatever...I guess there will be more of that to come. Onto the presents.......I had been begging Michael for a new purse for quite sometime. I'm pretty simple when it comes to purses and really I only have 3 that I use and I have owned all of them since college. My brown Coach one is a tad small...in fact it can barely hold my big girl wallet (you know the one with more than just my debit card and license) along with other essentials (phone, lipgloss, flipbrush, etc.). 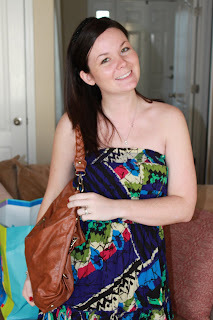 We just had a hard time justifying another $200 purse with a baby on the way. We finally found one for a mear $40 bucks at Francesca's and he got it for me! He also completely surprised me with shoes! That he picked out himself! That I actually liked! Unfortunately they are a tad bit small so they will be getting exchanged, but props to him all the way! I actually needed some like these. I'm still shocked apparently! Oh, please excuse the fact that we have yet to hang ANYTHING in the house. We will be getting on that...this week! Maybe a new home tour will be coming soon. 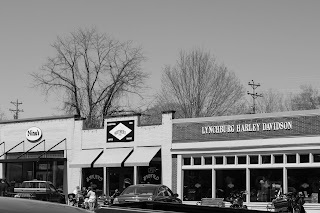 Next we headed to the small town of Lynchburg, TN which you might have heard of because it is where the Jack Daniel's Distillery is located. And if you are a motorcycle person it's a popular place to ride to and through apparently. They had several small shops to look through which of course included a lot of Jack Daniel's paraphernalia along with Harley Davidson gear. I was more interested in all the antique shops and plan on heading back soon to do some more thorough looking and perhaps some buying! And just a little tid bit about Lynchburg...you might be surprised to know that it is in fact a dry county. You can buy commemorative bottles of Jack there, but you would be arrested if you drank it. 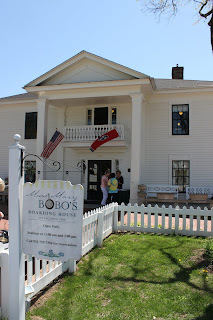 Our next stop and the most exciting part of the day to me was Miss Mary Bobo's Boarding House and Restaurant. You actually have to get reservations made months in advance and it is well worth it. They ring the dinner bell at 1PM and you are seated in groups of 10-12 in different rooms around the house so you actually sit with other people and have a hostess at your table. We were served family style and everyone passed around the various dishes to each other (always to the left). We absolutely stuffed ourselves in fact Michael and I didn't even eat dinner that night because we were so full. Our meal consisted of Fried Chicken, Meatloaf, mashed potatoes, fried okra, baked apples (made with Jack Daniels), macaroni and cheese, green beans, spoon rolls, and pecan pie topped with Jack Daniels whipped cream, and of course sweet tea to wash everything down. Mmmmm....hungry yet? After we rolled ourselves out, we headed over to the distillery to have a little tour. 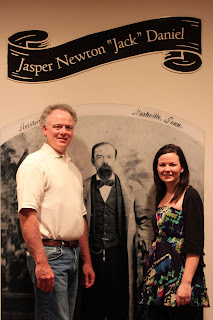 Before the tour you wait in a large room filled with Jack Daniel's history. Dad and I took a little photo with Jack himself. He was actually a pretty small man at only 5"2' and wore a size 4 shoe. He took over the distillery at age 14. 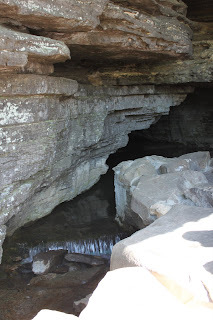 Jack Daniel's is made with only 4 ingredients, corn, barley, rye and TN spring water pictured below. Unfortunately you couldn't take pictures inside the tour. But I can give you a quick run down. 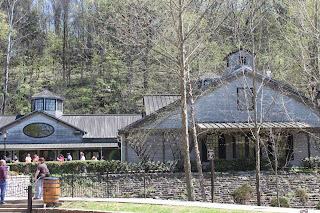 Jack Daniels is known for their Sour Mash which you actually get to see. And let me tell you it smells like next day throw up if you have ever shared a night with Mr. Jack. Ugh...I could hardly make it through without gagging. They drain the whiskey through a 14 foot vat of charcoal (made with Oak) before placing in in the barrel to sit for around 5 years. 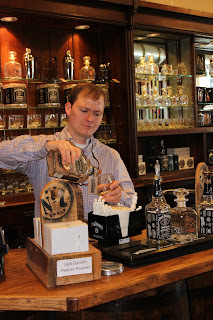 If you have ever drank Single Barrel it is actually put through the charcoal process twice. After our tour we headed back to The Sager farm where we all tried to eat cake (we were still stuffed) and I opened some presents. 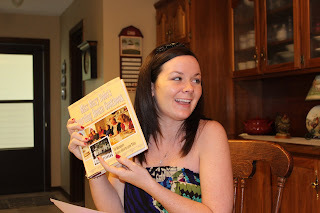 They were sweet enough to get me Miss Mary Bobo's cookbook (I'll be sure to post some recipes) and the Fix-It and Forget-It cookbook because I seriously have crock pot phobia. Shew, that's a lot of birthday! I hope next year is just as wonderful. It's going to be hard to top for sure. Although little pistachio will be around by then so I'm sure that will make it special enough! Looks like a great Bday!! Happy Birthday! Happy Birthday and congrats on the coming baby. 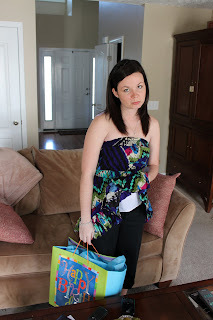 how fun if you take a photo each like throughout the pregnancy. You'll be amazed in a few weeks time. How fun it will be.